Welcome to the 47th issue to subscribers of Right Writing News. If you are reading this issue forwarded from someone, be sure and use the link below to get your own free subscription. 5) To Get In Print, Hit 'Em Where They Aint! While I applaud these three benefits from blogging, take a minute and think about the time and effort you are pouring into your writing. Can you balance that effort and turn a profit from your writing? Whether you are just starting a blog or have been blogging for some time, I want to give you the top ten ways to make money on your blog. 1. Create clever post titles. People don’t come to your blog to read advertisements. Instead, they come to read good content. And their first clue as to whether the content is good is based solely on the titles of your blog posts. That’s why you need to create interesting, benefit-driven post titles. 2. Optimize your content for the search engines. Your blog won’t put a dime in your pocket if no one reads your content and sees your ads. That’s why you should seek to optimize your content to pull in traffic from the search engines. You do this by finding out what keywords your market is already searching for in Google, and then including these keywords in your articles two or three times per 100 words of text. 3. Weave product recommendations into your content. Your ads shouldn’t be confined to your blog’s sidebar – you can also put them directly into your content. 4. Post regularly, such as twice per week. Doing so makes your blog “sticky.” It also gives your readers a reason to keep coming back and again and again, which gives you another chance to sell them something. 5. Create regular weekly features. This is another way to get your visitors to return on a regular basis. Example: You can create a feature called “Friday’s Super Tip,” where you post your very best niche-related tip every week. 6. Make use of your blog sidebar. You can post text ads, banner ads and other graphics, links to your best blog posts and a newsletter subscription form in your sidebar. 7. Rotate products on your blog. Doing so keeps your blog fresh. But it also gives you a chance to track and test your offers to see which ones put the most money in your pocket. 8. Use pictures. You can post relevant pictures in your articles as well as your sidebar, which will work to draw people’s eyes to your content and ads. You can get these photos for as little as $1 each at stock photo sites. 9. Encourage people to subscribe to your RSS feed. People who are subscribed are more likely to become a regular reader of your blog. 10. Get people on your newsletter list. One way to do this is to password-protect some of your best posts, and then offer access to these posts only to those who’ve subscribed to your newsletter list. Another way is through a Feedblitz account. Use the link to set up a 30 days trial. You can set up a simple way for people to subscribe to your blog and receive it through their email. I have over 500 subscribers to my blog using this system. These tips are just scraping the surface when it comes to making money with your blog. If you want to make real money with your blog, then you need an in-depth guide that shows you exactly how to set up a blog, create content for it and make money with it. 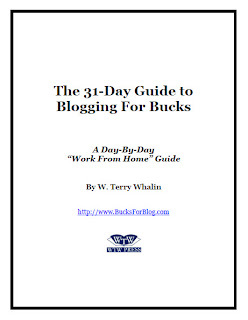 You can get The 31-Day Guide to Blogging for Bucks by going to: http://BucksForBlog.com. Recently, I spoke at the Fifth Annual Roaring Lambs Writers Conference in the Dallas, Texas area. There were over 200 people attending this sold-out event. As a publisher at Roaring Lambs Publishing, I met one-on-one with many of the participants to help them with their writing. The relationship building and interaction is one of the key benefits of making the effort to attend a writers' conference. I'm going to be attending several more conference this year. Follow this link to keep up on my speaking schedule. I'd love to meet with you and cross paths at a future conference. From meeting many writers at these conferences, I've learned one of the keys is to see where they are in the writing process and then help them however I can from my experience. Today I want to focus on one of those meetings with some specific advice yet I will also broaden the advice to work for every writer. This particular writer was typical of many writers that I meet. Jim was passionate about writing devotions. He had launched a blog and started to send these devotions to friends and gain readers. He clearly had passion because he had written over 300 devotions. At the conference, Jim was trying to determine his next steps for his writing. My first suggestion is to try to publish some of his devotions in printed magazines. Print magazines has a lot greater credibility than posting on a blog since it has a higher standard. There are many devotional publications. I suggested Jim try The Upper Room which reaches millions of people each day. This magazine has great guidelines and details for any writer on their website. In Jim's case, he had written a series of devotions. What is it that you have written? Maybe you love writing personal experience stories or fiction. Maybe you like to write how-to information. Find the print magazines that take your type of material. Study these magazines and begin to pitch story ideas to these publications. Yes, you be writing a novel and that writing can continue. But editors and agents are looking for writers with publishing experience. One of the fastest ways to get that publishing experience is in shorter writing (magazines). If you write fiction, you will learn a great deal writing short stories and publishing those as you continue to polish your novel. Finally I want to return to Jim's blogging. I believe in the merits of blogging. It's one of the reasons I have over 1,000 searchable entries in The Writing Life. As a resource for everyone who blogs, I'd like to tell you about The 31–Day Guide to Blogging for Bucks. This 65–page Ebook will give you the step-by-step guidance to doing more than creating content with your blog. You will be able to generate income from that effort. Each of us as writers have to find the right path for our writing. It may take a bit of searching to locate the right path but I believe it is out there for you. Are you engaged in the search? You need to change up your game plan. On one hand, you are to be applauded for getting your material out to the editor or agent for consideration. Some writers never even take that active step. Every published writer has had plenty of rejection, it comes with our profession. The basic task of every writer is to get their writing to the right editor for the right publication at the right place and the right time. There are many reasons for rejection and some of those reasons have to do with the writer and some of them have to do with timing. A key step to changing your game plan is to get some more information or training. This training can come from a writers conference or instruction from others online like my Write A Book Proposal course or from how-to books. It was toward the end of the second day of a panel of book editors and Marlene was speaking about Mike's book. I encouraged her to read Reason No 1. Flipping to the page she read, “Your Writing Is Crap.” It was not what you usually hear at a Christian writers conference. According to industry insiders, there are a million proposals, queries and book manuscripts in circulation in different literary agencies and publishing houses. If you have submitted anything to an editor, you normally receive a form rejection letter saying it didn't meet their editorial needs. The form letter gives no insight for why you were rejected. Mike Nappa pulls back the curtain and helps writers understand why their precious book pitch was rejected. He is straightforward and frank with his advice which is generously on every page of this well-written book. 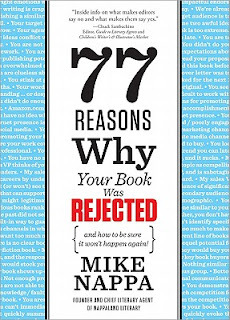 The 77 Reasons Why Your Book Was Rejected are divided into three main sections: Editorial Reasons for Rejection, Marketing Reasons for Rejection and Sales Reasons for Rejection. With Nappa's years of experience as an editor and agent, he has poured terrific value into this book. No writer likes to be rejected but every writer can profit from a detailed study of this book. I highly recommend it. You have selected a topic that you love and started a blog. For most of us, we are passionate about that topic and it is a fun place to write our thoughts. While the word “blog” has become common it started from the term web log or a place on the web to log your thoughts. According to one site, there are over 450 million active English blogs. I enjoy writing in my blog yet in these challenging economic times, I also see the value in combining my passion with earning some money. I want to show you several different ways you can either start a blog or begin to earn from your blog. And since a blog is so flexible, there are plenty of ways to monetize it. You can put permanent banners and text ads in the sidebar. I encourage you to take a moment and look closely at what I've done on The Writing Life. If you click some of the banners, you will see they refer to some of my products such as my Write A Book Proposal course or my book, Jumpstart Your Publishing Dreams. You can also weave your product links into your actual blog posts. There are plenty of big companies that have affiliate programs. One of the most popular affiliate programs for physical products is the a Amazon.com program, simply because your buyers already know and trust Amazon.com. But if you’re going to sell downloadable information products, then one of the best affiliate programs is via Clickbank.com, where you’ll find thousands upon thousands of products to sell. Best of all, the commission rates are generous. You’ll see them as high as 50% and even 75%! I've written a free 30–page Ebook, You Can Make Money. Just follow the link and get it. Still another way to make money on your blog is by showing Google AdSense ads on your site. You make money every time someone clicks on your ad! You don’t have to sell a thing. You don’t have to convince anyone to buy. All you have to do is post good content on your site to attract prospects… and you get paid every time they click on an ad. It’s easy! I’m sure by now you can see that there’s a world of profitable opportunities waiting for anyone who wants to start up a blog. If you’d like to know what the Internet's wealthiest bloggers know about making money with a blog, then look no further than The 31 Day Guide to Blogging For Bucks. I encourage you to get your copy right now—risk-free since you can use it for 60 days. This guide will really open your eyes to the possibilities! To Get In Print, Hit 'Em Where They Aint! Willie Keeler had a simple explanation for his batting prowess: "I hit & 'em where they ain't." If you yearn to see your name in print, you might follow Willie's example. Why not "hit 'em where they ain't" by going where there's less competition? One excellent -- and underserved -- field is writing nonfiction magazine articles. Nonfiction can be profitable because you can use the same research on several pieces. Find a topic you love, gather your information, and then craft several articles for different markets. Remember that children are most interested in the "how" and "why" of a subject, especially if you present it in a humorous or unique way. Longer how-to articles. These differ from straight activities because they require more of an introduction than, "Have you ever wanted to make paper dolls? Here's how!" Many magazines have theme lists for each issue, and want activities that also present information related to the theme. That same paper doll activity might be prefaced by several paragraphs on the history of paper dolls in the U.S., or focus on paper dolls manufactured during a particular decade. The "how-to" element would follow, with clear, step-by-step instructions children can complete on their own, or with minimal adult supervision. How-to articles for older readers might involve self-help topics, or tips for improving relationships, getting organized, or landing a summer job. Break these more abstract topics into several steps and use catchy subheads to keep the article entertaining. Interviews and profiles. You don't have to look far to find subjects to profile for magazines. Many publications want articles about kids doing interesting or unusual things. Research potential markets before finding your subjects, as each magazine's audience and focus differs. Interviews with adults in your community who have unusual jobs or ordinary people who are making a difference in the world are also good subjects. Center your interview questions around areas the magazine's target audience would find most fascinating. Biographies. Many magazines need short biographies of adults whose lives are connected to themes for upcoming issues. When writing a magazine biography, focus on a small aspect of the person's life, such as a pivotal childhood experience that inspired him to take a certain path in adulthood, or the one or two accomplishments for which that person is best known. Or, for famous subjects, highlight some obscure achievements. Many magazines love to receive biographies of unknown people who had an impact on a big moment in history. . Feature articles. If you enjoy research and are passionate about a topic, wait until you uncover some new, interesting, or tantalizing facts that would fascinate kids. Then study several recent issues of magazines for different age groups to determine which publications might be interested in a feature article on your subject. Many nonfiction editors prefer to see a query letter describing the article, the age group, and the slant you're planning to take on the topic before you write the entire piece. Note the format of each publication you're querying so you can mention any necessary sidebars, graphs, timelines or photos you'd need to provide. Reviews. Some magazines have regular departments that take freelance reviews of children's software, video games, books, or other products. Check the magazine's guidelines before submitting any reviews, as sometimes they're staff-written or written by kids. Also note if the reviews are targeted to the children reading the magazine, or to their parents. Regardless of the type of magazine nonfiction you write, your best chance for publication is if you custom-fit each submission. Study each magazine's style, note if the articles tend to be light and humorous or have a more scholarly tone. Design your submission to look as if it belongs in the magazine by including sidebar material or photographs, if needed. Give the editor something she can use, but written in a way she's never seen before. Some of you will have to use your imagination a bit because you don't have a lot of publishing experience or even if you have publishing experience, just let go and imagine for a few minutes. You've been offered a new position as a magazine editor. Now your responsibility is to reach your target audience with solid writing on a regular basis. You will have to write a few articles. You will have to reach out to other writers and get their material. You will look for some products to review and advertise. Then you will add subscribers and be involved in the business aspects of producing your publication. Feel a bit overwhelmed with the responsibility? It doesn't have to overwhelm you. In fact, there are easy-to-use resources to help you create the content for your publication. I've often encouraged writers to begin their own magazine—an electronic newsletter. This magazine is a consistent way you can reach out and touch your audience with solid content—and remind them that you want to help them in your particular subject or area of expertise. I have had a newsletter for many years, Right-Writing News. Follow the link and you can see it and subscribe to it. When you subscribe you will receive free ebooks—and access to all of my years of back issues. Publishers, editors and agents are actively looking for good writers but they want these writers to come to them with a ready-made audience. What are you doing to create this audience? Yes, you are working at your writing and storytelling skills—which is excellent. But are you making audience-building a priority? I hope so because having a ready-made audience could be the tipping point between finding your champion inside the publishing house and a form rejection. Robert W. Bly has been one of my long-term friends and a mentor in this area of newsletter creation and marketing. 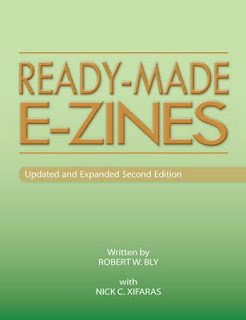 His Ebook, Ready-Made Ezines, has a revised second edition and is excellent. In the first part of this Ebook, Bob provides important details about the creation and writing of an Ezine. He answers important questions such as: Why do you do it?, How frequently to you touch your audience?, How do you expand your audience and get people's email addresses?, How can you create it in two hours or less?, Do you send the Ezine in HTML or text?, What are the two most important lines in every email? What are the 14 things Bob likes to put into his Ezine? In the second portion, Bob gives the lasting value of this particular resource: ready-to-use Ezine articles on different topics that you can cut and paste into your own Ezine. The articles are organized into ten different categories for easy use. This valuable resources is an investment in your own writing life but from my view it is well worth it. You will gain education and the practical articles that you can use for weeks into the future to build your own audience. This resource matches a consistent message that I've been giving to writers. Every writer needs to be developing their own audience and their own products. If you don't have an Ezine, then take the first step with Ready-Made Ezines. If you already have an Ezine, then you will find more ideas and a treasure-trove of ready-t0–use articles. I'm going to be using this resource in the days ahead. How about you? Content marketing: We all know that we need to create content and lots of it, but who has the time? Well, now you can use your blog as a content-creating machine. You can develop original content there and push it out to different areas. For example, I will sometimes use my blog posts for Twitter updates, Facebook updates, and article syndication. So now that I've convinced you to blog, I want to refer you to another piece I've written on blogging called "How to Become a Powerhouse Blogger in 15 Minutes," http://www.huffingtonpost.com/penny-c-sansevieri/how-to-become-a-powerhous_b_765327.html. I hope that this piece, along with the tips provided above, will help you launch or reinvigorate your blogging campaign.